These protein bars are the perfect bars to make in the summer, when strawberries are in their prime. They’re especially delicious if you keep them in the fridge and enjoy them cold after good workout – they combine fresh strawberries with strawberry protein powder to create an absolutely sensational explosion of flavor, texture, and nommage! 1. Do as you do with all my bars: blend everything together using a food processor or handheld blender. 2. Shape the dough into bars. 3. Melt 4 big squares of dark chocolate (40g), dunk the bars in there, place them on a tray (or plate) lined with aluminium foil. 4. Add half a strawberry on top of each bar. Stick them in the fridge for a couple of hours and PRESTO! You’re done. Macros per bar (out of four): 150kcals, 9g protein, 7g carbs and 10g fat. Note: Something you can do to turn your bars a further notch is use cream instead of milk to bind your batter – your bars will be more decadent, of course, but they’ll taste like strawberry and cream Heaven. PS: For these and other cuhrayzeh protein bar recipes, check out the Protein Pow Bar Ebook at http://proteinpow.com/ebooks. It contains some of my all-time favorite bar recipes, most of which no longer feature at proteinpow.com. 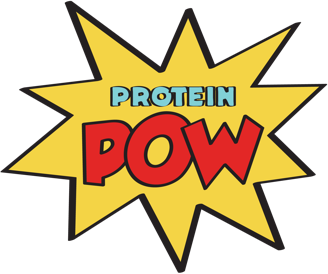 Also, check out the Protein Pow App – it’s available for both iOS (iPhones/iPads) and Android!